Roman Arches - the arch that has evolved from trial and error. 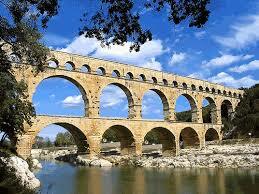 The Romans have perfected an arch, called the Roman Arch, based on the discoveries of past architects. The Roman Arch is unique on how it disperses forces. Static means stationary or at rest. It relates to the type of physics that is measured primarily on the forces, as the objects the forces are acting on are and remain at rest. Roman arches do not move (they shouldn't move, that is!) when a force or forces are applied to them. The study of Roman arches rely on static physics. While F=ma, or the forces acting on a object equals the mass of the object multiplied by the acceleration, is actually F=0, as a=0. A normal support consists of two pillars and a cross-member. Modern door frames have this type of design. This design, however, can only take a limited amount of weight pending on the cross-member's length. The Greek Parthenon used this type of design. As you can see, the cross-members are supported by pillars, however that distance of support is very small. 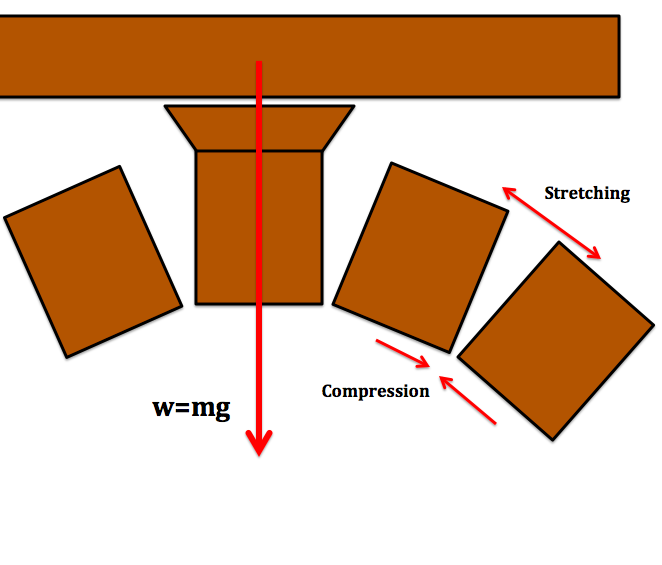 A stone, when taking on a force, undergoes compression and stretching when supported on pillars. As the stone is pushed or pulled down, the bottom of the stone stretches while the top compresses. That stretching ultimately breaks the stone. 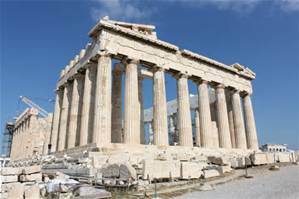 In the Parthenon's case, the distance the stones cover is small enough to support the structure, which has been proven for thousands of years. In the above diagram, you can see how the force applied on top is dispersed to the pillars. This force also creates the compression and stretching of the cross-member. In order to span longer distances without using as many support pillars, the Romans perfected the Roman arch. The Roman arch can span and support great distances, enabling the Romans to build grandiose structures such as domes and aqueducts. 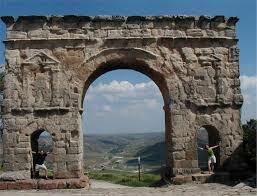 ​The force applied to the top of a Roman arch is dispersed down the sides due to the shape of the arch way. The angled supports enable the forces to be directed down the sides of the arch. Therefore, the stretching that occurs with a normal support is now at the "Springing Line", where there is no support to stretch. Stretching still does occur, however it is also dispersed down the "Intrados Arch". The compression of the arch now occurs at the "Extrados Arch". The overall force is applied downward and out at the points of the "Piers". Now the "Striking Point" does not break the support over long distances. The "Keystone" is the most important stone in the Roman Arch. It supports the entire archway, and bears the most weight to disperse. It is exaggerated in the picture to the right to indicate which block it is. The Keystone block creates a static equilibrium in forces due to its position, exerting the forces evenly down the sides of the arch. The Roman arch creates a static equilibrium; all forces are balanced within the structure and therefore distributed evenly. The major force exerted on an arch is Weight. Weight = Mass x Gravity, or w=mg. Roman Arches are best supported by the surrounding objects above it and to its sides. The forces are ultimately exerted outwards as well as downwards, meaning that the arch has to be supported by external objects. The picture to right shows how each arch in the aqueduct is supported by another, along with outlying bricks surrounding the archways. 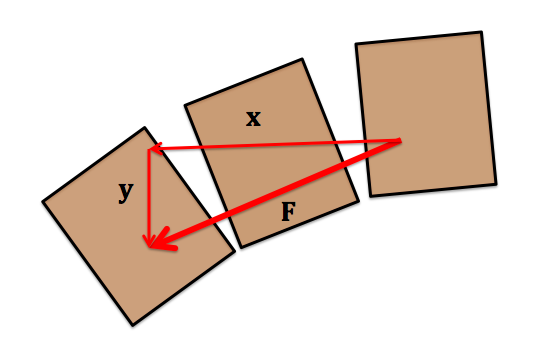 The diagram on the right shows how the x-component of the Force creates that outward force. The y-component creates that downward force. 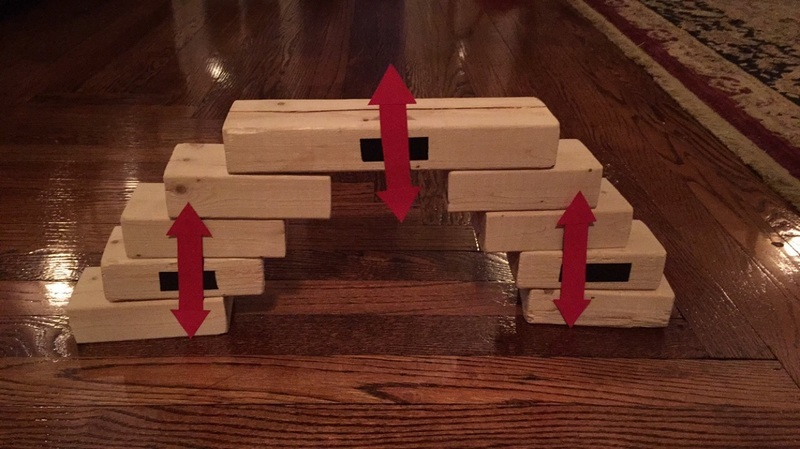 In order to demonstrate the purpose of a Roman arch, I have built a roman arch out of wooden blocks. In order to compare it with another structure, I have also created a Corbel arch, an arch that demonstrates another way to distribute force. 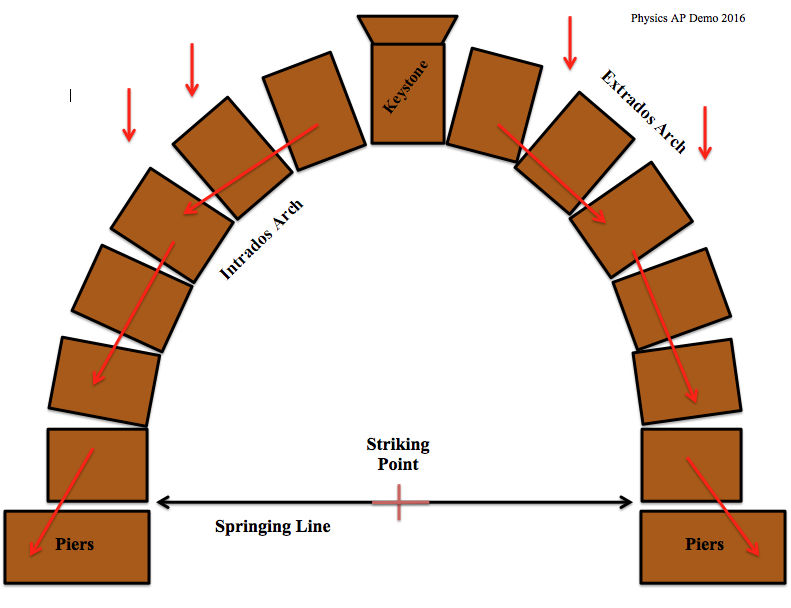 A Corbel Arch demonstrates how multiple segments in an arch take on a force. The difference from a Roman arch, however, is that this arch directs the forces straight down. The Roman arch was created through the evolution of this arch. A corbel arch takes many horizontal supports and is more subject to failure than a Roman arch, as a Roman arch evenly distributes the force exerted on it. Roman arches also allow more open space below itself. The Corbel Arch is used in many ancient structures, however the Roman arch is the most prevalent. Here, you can see how the Corbel Arch is built, and how forces act upon it. These three red arrows on the left indicate on the general area of force, as the whole arch is being exerted by a downward force as it supports itself and whatever is above it. In order to construct the Roman Arch, I designed blocks of the the same dimensions to created the arch. 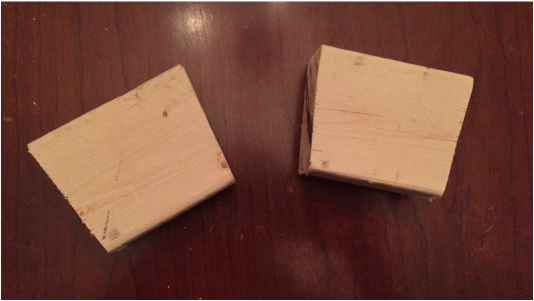 I made 12 of these blocks. I then constructed a custom Keystone Block for the top that would convenience the structure to withstand downward force. There are 13 blocks total. 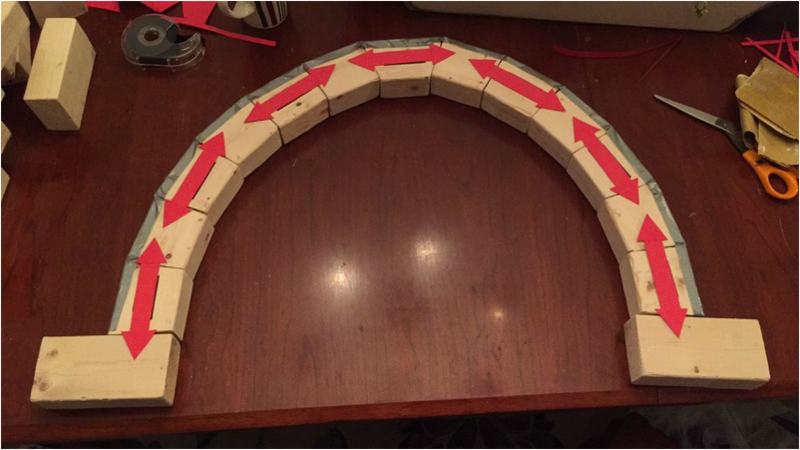 In order to exemplify the net forces acting upon the arch, I attached red force arrows with magnetic tape. Duct tape was used on the outside of the arch to just keep it together for showing purposes and construction. It serves as no support device. This Roman arch exemplifies the the arches used in so many architectural buildings today and in the past. This is one of the strongest structures people use, and they also come in different shapes and designs, with the same overall concept. Roman Arches are a modern marvel, and are very fascinating on how they work. The ancient Romans discovered their power of static equilibrium, and that discovery exists today in ancient structures. The world would not be the same without these fascinating structures. Thanks for taking the time to appreciate this project.